Make sure to keep a civil tone, though. I know that tempers run high on this issue, so choose your words carefully. Holy cats! What was that post about? Israel’s treatment of Palestinians? Whether the tea party is full of racists? President Obama’s socialist tendencies? 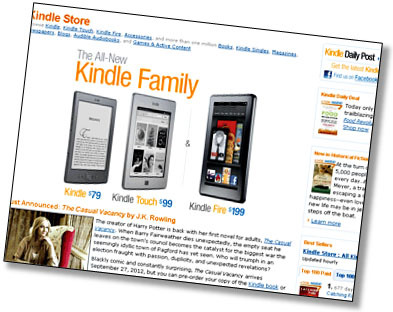 [Retailers] would be permitted to discount  individual e-book titles by varying amounts (for example, some could be “buy one get one free,” some could be half off, and others could have no discount), as long as the total dollar amount spent on discounts or other promotions did not exceed in the aggregate the retailer’s full commission from the Settling Defendant over a one-year period. This provision [allows publishers] to prevent a retailer selling its entire catalogue at a sustained loss. If I’m reading this right, this sounds like a big win for Amazon. Under the old wholesale model, Amazon was taking an actual loss on all those $9.99 e-books. Under the modified agency model here, Amazon could discount every single title by 30% and still break even. Most likely, this means the end of the agency model in the e-book market. Nobody wants to make life easier for Amazon, after all. The question then is how long Amazon is willing to sustain losses on its e-book business. A long time probably. But if publishers go back to a standard wholesale model, and Amazon goes back to its loss-making $9.99 price point and regains the 90% market share it had previously, I wonder if, at some point, they open themselves up to a DOJ investigation for predatory pricing? That’s a tough case to make, but not necessarily an impossible one. Or, alternatively, some completely new distribution model takes over. I won’t speculate about that since I’m sure anything I could dream up has already been discussed to death elsewhere. But there are plenty of fairly obvious ideas, since e-books simply don’t require the kind of distribution channel that physical books do — and if Amazon does end up in a monopoly position for e-books, I imagine DOJ will eventually force them to open up the Kindle platform so that others can download e-books to Kindles. Interesting days ahead for book publishers. I’m sure glad I’m not one.